Several thousand people visit the Riksdag every year. The Riksdag is open for anyone wishing to attend a debate or public hearing, take part in a guided tour, or participate in a study visit. Everything that takes place in the Chamber is open to the public. Openness and transparency are central to Swedish democracy. Anyone who wants to can visit the Chamber to listen to debates, votes and question times, as well as public hearings and seminars. Guided tours in English are also available for the general public. The Public Gallery has approximately 500 seats and is always open to the public when the members of the Riksdag meet in the Chamber for debates and to take decisions. Security controls are carried out for visits to the Riksdag. Arrive in good time, about 10 minutes before the tour is due to start. Some debates attract a large number of visitors, and there may be queues to the security control. This is often the case for debates between party leaders, the annual foreign policy debate and the Prime Minister's Question Time. Allow for more than 10 minutes to come up to the Public Gallery. For security reasons, bags and outer clothing have to be left in specially provided lockers. They require a 10-SEK deposit, which you will get back after your visit. Please remember therefore to have a 10-SEK coin with you. The entrance is accessible to people with disabilities. The entrance is manned during the day. An intercom to the Riksdag's emergency service centre is available at the entrance. Photography is permitted from the Public Gallery, but not with flash. Taking close-up pictures of notes or documents on members' desks or on the platform is prohibited. The committees hold a number of hearings that are open to the public. The idea is to provide members of the parliamentary committees with more information on a specific subject. When a hearing is held, the committee invites experts and representatives of various stakeholders to answer questions from the members. Security controls are carried out for visits to the Riksdag. Arrive in good time, about 10 minutes before your visit is due to start. In the meeting rooms, there is ample room for wheelchair users. The premises are also equipped with hearing loops. There are toilets for the disabled. Guided tours to the Riksdag are arranged for the public and for organisations. 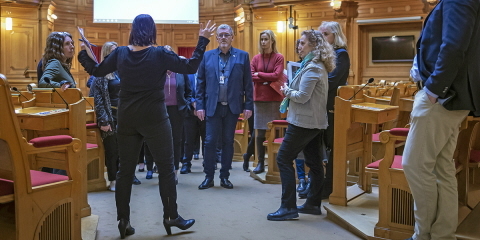 During the tour you will learn about the work of the Riksdag and the duties of the members, what is happening in the Riksdag today and the history of the Riksdag. The guide is always happy to answer questions. From the middle of September until June, while the Riksdag is in session, guided tours for the general public are held on Saturdays and Sundays. Tours in English are available at 1.30 p.m. on Saturdays and Sundays. There is a break in guided tours at the weekends during the Christmas and New Year holiday period. During the summer (24 June–16 August) guided tours of the Riksdag will be held on weekdays. Guided tours in English: Monday to Friday 12 noon and 1, 2 and 3 p.m. Guided tours in Swedish: Monday to Friday 11.30, 12.30, 1.30, 2.30 and 3.30 p.m. It is not possible to book guided tours in advance. All tours are free of charge and there are 28 places available for each tour. From September to June, there are tours of the Riksdag for groups on Mondays, Tuesdays and Fridays. These tours all have to be booked in advance. The number of visitors per group is 10–30 people. Schools can book group tours for the seventh grade upwards. The telephone is open Tuesday–Thursday, 9–11 a.m. If you are a teacher for the seventh to ninth grade of secondary school or for the upper-secondary school, you can take your students to the Riksdag for an educational visit. Students from grades 7–9 can become members of the Riksdag for a day in an interactive role play at the Democracy Workshop. Upper-secondary school students and adult students studying Civics can also come to the Riksdag on a study visit. The Riksdag Library has been in existence since 1851 and is one of the few parliamentary libraries in the world that is open to the public. It is a specialist library for the social sciences and law. Its main task is to provide the Riksdag with data necessary for decision-making and the collections have been built up to suit the needs of the Riksdag. Most of the books in the Library can be borrowed.